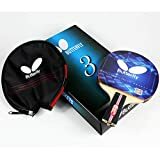 The Butterfly 302 Chinese Penhold Table Tennis Racket Set contains a high quality ping pong paddle and ping pong paddle case in a gift box that is perfect for any occasion. This high value ping pong racket will give you a good mix of spin, speed, and control for competitive ping pong games. 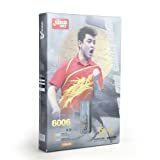 It is the perfect racket for all levels of ping pong players, but mostly for beginner to intermediate table tennis players. The table tennis rubber is red on the forehand side and black on the backhand side. It is assembled with Yuki 2.1mm table tennis rubber that is approved by the International Table Tennis Federation for tournament play. The Yuki rubber provides a springy feel and extra sticky for more spins on your ping pong shots. This ping pong racket will help you smash your opponent. The racket is the chinese penhold style, which is gripped like you would hold a pen. A ping pong paddle case is included to protect the table tennis rubber from harmful elements. This prolongs the life of your ping pong paddle. Butterfly table tennis paddles come with a 30 day manufacturer warranty. Butterfly table tennis rackets are the preferred rackets of professional table tennis players around the world. Step up your ping pong game with the 302 Chinese Penhold Ping Pong Paddle by Butterfly Table Tennis! The Butterfly 303 Penhold Table Tennis Racket is engineered to help you win every time. The racket, designed for the penhold grip, is assembled with Butterfly Yuki rubber on one side and Magnitude on the reverse. The Yuki rubber is extremely tacky, offering tremendous spin. Meanwhile, Magnitude is a pips-out rubber with a longer pip than most traditional pips-out surfaces. This longer pip will add numerous varieties of spin to your arsenal. Finally, the hard 2.1mm sponge layer will provide excellent quickness and speed. It also comes with its own racket cover. Over the last 40 years, Butterfly has established a reputation of providing the best in table tennis equipment. Butterfly believes this commitment to the sport of Table Tennis, and its growth, is essential to the maturation and recognition of the recreational market worldwide. Made by Butterfly. Extremely tacky rubber on both sides offers high spin. Hard 2.1mm sponge layer provides quickness. Longer pips-out surface. Includes racket cover.